Olivia Jane Rhoads was born today at 2:34pm. 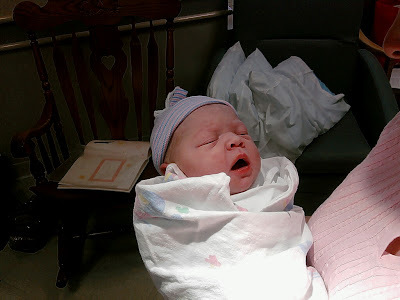 She weighed in at a healthy 8 lbs 5 oz and is 21.5" long (incidentally the same length as her sister.) Heather went into labor at 1:00am and we were at the hospital by 3:00am. It took forever for Heather to get fully dilated, but once she got there, she only had to push through 4 contractions to get Olivia out. The doctor almost dropped her, but thankfully they set up a "net" of sorts to catch dropped babies. (Apparently that happens from time to time.) Heather looks a lot better than she did after giving birth to Abby. I can't wait to get Abby up here tomorrow to meet her baby sister. Our friend Danielle was kind enough to take a day off of work to take pictures for us, so I hope to have some more pictures up over the weekend.